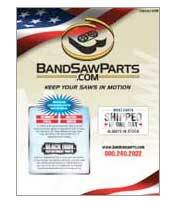 Carbide guide for all Behringer Saws running the 2 5/8" wide band saw blade. Example is model HBP 1080. Four pieces are needed for a full set.